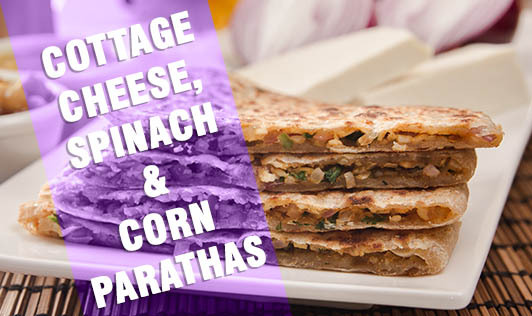 Cottage cheese, spinach & corn parathas are filling, and will keep your growing kid content until the next meal. It will most certainly solve all your problems about your kid being a picky eater, as the parathas contain spinach as well and your child will eat the nutritious spinach mixed into the dough! Mix the wheat flour, corn, spinach, green chilies, and salt together in a bowl, add enough water and knead to make soft, smooth dough. Set aside for 5 minutes. Knead the dough again with ¼ tsp of oil and keep the dough wrapped under a wet muslin cloth. Divide the dough into 10 equal portions and roll into 4” thin rotis using a little flour. Place the rotis on a flat surface, sprinkle 2 teaspoons of cottage cheese on it and spread evenly. Cover this with another roti and press lightly. Heat a nonstick pan and cook each paratha using a little oil until they turn golden brown on both the sides. Serve immediately with curd or mint chutney.